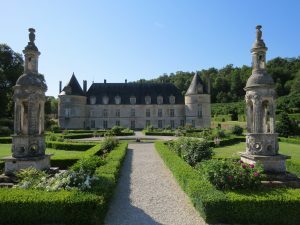 …is a castle in the field of community Bussy-le-Grand in the department Côte-d’Or in the Burgundy region. The complex consists of several buildings: the main building, a servant’s house, a dovecote and a chapel from the 17th century. The castle surrounded by a large park is a listed building since 1862. His most famous owner was Roger de Bussy-Rabutin. He was exiled by Louis XIV from Versailles to his castle in Burgundy because of indiscretion. 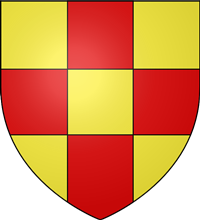 The castle is situated about 7 kilometers northeast of Alise-Seinte-Reine and approximately 13 kilometers north of Flavigny-sur-Ozerain. The castle was built as a fortified building, but at the beginning of the Renaissance it as renovated increasingly homely and is therefore considered as a renaissance castle. In 1602 it came into the possession of the family Rabutin, who sold it in 1733. The towers are from a castle-like complex of the 15th century. The ditches, renewed in the 17th century, were originally to cross with drawbridges. After 1520, the lateral wings were built and in the 17th century the conical roofs were added. On the ground floor arcades form an open gallery with compound curves. Between the rear towers you will find the main building which was completed in 1649. You can see more than 200 paintings of the most important dignitaries of those times in the castle. The paintings are interspersed with quotes and descriptions of Bussy-Rabutins, sometimes sarcastically. The castle comprises extensive gardens. On the other side of the valley you can see the village of Bussy-le-Grand. The garden was designed by the French landscape architect André Le Nôtre patterned like the gardens of Versailles. A deciduous forest and a terraced landscaped park are surrounding the castle. In the palace gardens is a labyrinth and a shady beech and hazelnut grove. The outdoor facilities include a total of 34 hectares and are surrounded by a wall since the beginning of the 19th century. 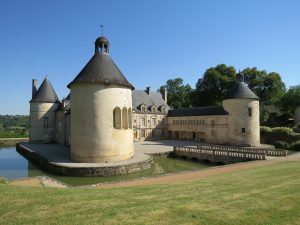 The palace is part of the Route Ducs de Bourgogne. You should keep the ticket, because you will get discounted entry to further castles on this itinerary (see also Castle Commarin).